A new poll of Iranians finds that in the wake of the parliamentary election, Rouhani is in a strong position with the Iranian public. Sixty-three percent say they voted for candidates who support Rouhani, while just 22% say they voted for his critics. Rouhani’s support is not limited to voters who favored the Reformist group. 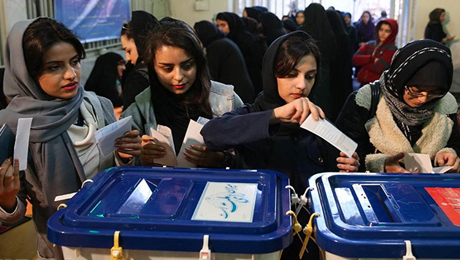 Even among those who voted for the conservative Principlist group, 50% said they voted for pro-Rouhani candidates, as did 81% of pro-Reformist voters and 61% of voters for independents. This does not mean that Reformists now have the upper hand in the Majlis, the Iranian parliament. Only 33% of Iranians who voted, said they voted for Reformist candidates, while 35% said they favored the conservative Principlist candidates, and 24% independent candidates. “President Rouhani did not actively campaign against any specific political group and this appears to have paid off for him as he now has very broad-based support,” comments Ebrahim Mohseni, a Research Scholar at the Center for International and Security Studies at Maryland (CISSM). One of the sources of Rouhani’s support may be the positive views of the deal he struck with the P5+1 countries over Iran’s nuclear program. Overall, 73% approve of the deal, including 61% of pro-Principlist voters, 81% of pro-Reformist voters, and 71% of voters for independents. Among voters for pro-Rouhani candidates, 81% approve of the deal, as compared to 45% among those who voted for his critics. At the same time, enthusiasm for the nuclear deal appears to be softening. While the percentage approving of the deal continues to be above 7 in 10 (71% in the current poll), the percentage saying they strongly approve has been on a steady downward slide from 43% last August to 27% today. Confidence that the US will live up to its obligations under the deal has slipped from 45% in a September 2015 Gallup poll to 29% in the current poll. These reservations may also be affecting the enthusiasm for Rouhani. While his favorability rating continues to be very high—84% in the current poll—the numbers saying they have a very favorable view have dropped from 61% last August to 40% today. This decline may also be related to views of the economy. While last May 54% saw the country’s economic situation as good, only 46% say that now. Nonetheless, 52% are optimistic that Iran’s economic situation is getting better, while 33% say it is getting worse. A large majority (64%) also favors increasing economic engagement with western countries—a direction advocated by Rouhani. Rouhani supporters are especially supportive of this greater engagement (71%), though 54% of supporters of Rouhani’s critics also favor it. Nonetheless, a larger number (58%) continue to put a higher priority on achieving economic self-sufficiency, including 55% of Rouhani supporters, than increasing trade with other countries, which is seen as a priority by 36% of Iranians. Views of the election itself are fairly positive. Forty-four percent say the elections were very free and fair and another 39% say they were somewhat free and fair. The vetting of candidates by the Guardian Council, which disqualified about 45% of the 12,000 who sought to run for office, did not appear to be foreground. Only fourteen percent said they were unable to vote for a particular candidate they wanted because he or she had been disqualified. Thirty-one percent say they were very satisfied with the final range of candidates on whom they could vote, though a larger number –48%– say they were somewhat satisfied. Similarly, 35% percent say they were very satisfied with the Guardian Councils performance in vetting candidates, while another 39% say they were somewhat satisfied. Only 17% said they were dissatisfied with the Guardian Council’s performance. Two in three respondents say they believe that it is important for President Rouhani to seek to increase civil liberties in Iran, and seven in ten are hopeful that the next parliament will be successful in increasing civil liberties in Iran. However, just 12% complain that Iranians have too little freedom. Also, from among a range of possible measure the next parliament could pursue, a majority (51%) of Iranians want the next parliament to focus on reducing unemployment and another 22% want the parliament to attend to the problems of the poor. Only a small minority (3%) want the next parliament to focus on increasing civil liberties in Iran. Large majorities approve of Iran’s involvement in Syria (80%) and want Iran to increase the role it plays in the region (67%), its support of groups fighting ISIS (63%), and its support for the government of Bashar Assad (51%). Despite their suspicions of other countries operating in the region, eight in ten Iranians approve of Iran participating in the international talks on the conflict in Syria, and an overwhelming majority (87%) approve of Iran collaborating with other countries to end the conflict in Syria. Yet, while as recently as last August a clear majority (59%) approved of direct cooperation with the US to counter ISIS in Iraq, views are now divided with 47% approving of such cooperation. The study is based on two telephone polls, one conducted before and the other conducted after the parliamentary elections in Iran. The first poll was conducted February 15 – 24, 2016 among a representative sample of 1,016 Iranians and the second poll was conducted March 3 – 13, 2016 among a representative sample of 1,005 Iranians. The margin of error for both polls is about +/- 3.2%. IranPoll.com, an independent Toronto-based polling organization, conducted both polls for CISSM by calling into Iran from Toronto, Canada.